Vandals strike again!!! Someone stole most of the marigolds from the waterfall this weekend. Please pardon the lack of flowers at the waterfall, we are trying to decide if replanting is possible or even wise. 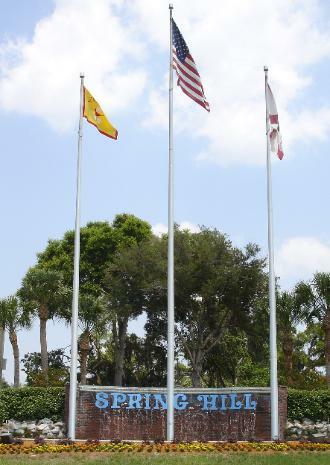 In response to widespread desire in the community to restore operation of the Landmark Spring Hill Waterfall, in 2011 the Spring Hill Garden Club took on the costly and labor intensive project of restoring and maintaining the Waterfall. Then in 2014 the Garden Club returned the maintenance of the Waterfall back to the County. 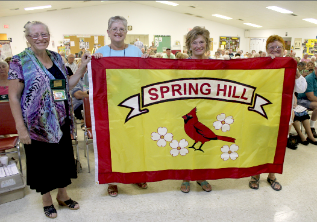 The plantings are still under the willing hands of the Spring Hill Garden Club. We need volunteers to keep this landmark looking it's best, please consider helping on Saturday mornings, everyone is welcome, no experience necessary!!!! It was a really awful, cold, windy day this year 2017, but we still received some beautiful poinsettias for the waterfall... Thank you all for braving the weather to make the waterfall beautiful for the Holidays!! !